Jussi Jaaskelainen, goalkeeper joins from... Bolton... funny that! 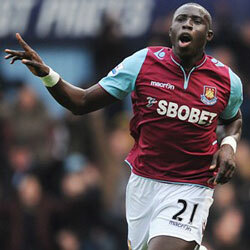 West Ham have confirmed the arrival of Wigan midfielder Momo Diame on a free transfer. Wolverhampton Wanderers sign striker Frank Nouble on a two-year contract. Goalkeeper Robert Green moves to QPR on a free transfer! West Ham release... John Carew, Julien Faubert, Abdoulaye Faye, Papa Bouba Diop. George MacCartney signs for us (again) after last season's loan period. Freddie Sears sold to Colchester United. Mali Striker Modibo Maiga signed from Sochaux. James Collins rejoins West Ham from Aston Villa. West Ham sign French midfielder Alou Diarra from Marseille. 18th Aston Villa (h). 1-0. Nolan. James Collins gets Man of the Match as the Hammers get off to a winning start. Matt Jarvis joins from Wolves for a club record tranfer. Sam Baldock sold to Bristol City. ★ 25th Swansea City (a). 0-3. Two howlers from Jaaskelainen and Collins give Swansea a 2 goal start! 28th Crewe Alexandra (h) Capital 1 Cup - Rd 2. 2-0. Maynard, Maiga. 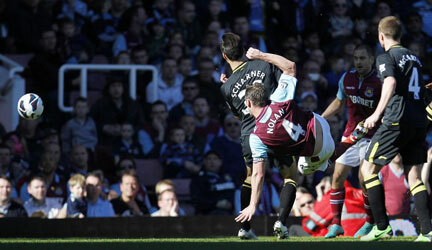 Sweet strike from Maynard, surely he must start against Fulham! Yossi Benayoun from Chelsea, both join on season loans! Nick Maynard sold to Cardiff City. ★ 01st Fulham (h). 3-0. Nolan, Reid, Taylor. LP:6th. 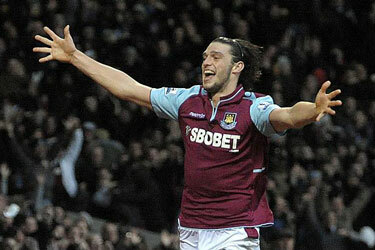 Carroll makes an impressive debut as we go 3-0 up by half-time! Andy Carroll sidelined for 6 weeks with a hamstring injury! ★ 15th Norwich City (a). 0-0. 22nd Sunderland (h). 1-1. Nolan. LP:9th. Shots on goal... whufc 20 - sfc 4. Nolan equalises in the 4th minute of injury time! Mark Noble signs new contract. 25th Wigan Athletic (h) Capital 1 Cup - Rd 3. 1-4. Maiga. 1 nil up... then given a bit of a spanking! ★ 01st QPR (a). 2-1. Jarvis, Vaz Te. LP:7th. Hard earned result, 8 players booked! Carroll on for last 10 mins. ★ 06th Arsenal (h). 1-3. Diame. LP:8th. Cracking first goal for the club from Diame. Vaz Te out for 12 weeks with dislocated shoulder. ✈ 20th Southampton (h). 4-1. Noble x2 (1x pen), Nolan, Maiga. LP:7th. Poor 1st half, then 2 goals in a minute at the start of the 2nd get things going! ★ 27th Wigan Athletic (a). 1-2. Tomkins. Second best all afternoon and but for Jaaskelainen it could have been alot worse! Disappointing! And now ladies and gentlemen... 2 months of tough fixtures! ★ 06th Manchester City (h). 0-0. Nolan scores a cracker only for it to be ruled off-side. Replays showed it was on-side! ★ 10th Newcastle United (a). 1-0. Nolan. Took the lead early and then defended well. ★ 19th Stoke City (h). 1-1. O’Brien. Very physical game, with a draw just about the right result. ★ 24th Tottenham (a). 1-3. Carroll. LP:8th. Disappointing. Carroll scores his first goal for the club. ★ 27th Manchester United (a). 0-1. LP:10th. Concede after 33 seconds of kick-off. Carroll injured and out for 6-8 weeks. ★ 01st Chelsea (h). 3-1. 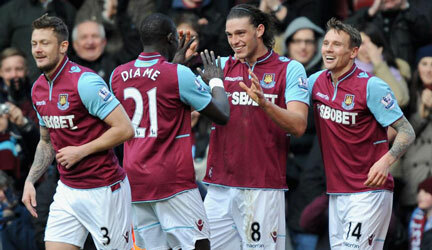 Cole, Diame, Maiga. Trailing 1-0 after a poor poor half, on came Diame and Taylor. Sweeeeet! ★ 08th Liverpool (h). 2-3. Noble(p), Gerrard OG. Winning 2-1 and cruising, Diame goes off injured... it all falls apart. Diame out for 4 weeks. ★ 15th West Bromich Albion (a). 0-0. 22nd Everton (h). 1-2. Cole. One nil up, Cole is sent off. Everton deserve to win. Carlton Cole's red card against Everton is resinded. Yossi Benayoun returns to Chelsea from loan due to ongoing injury. 29th Reading (a). 0-1. LP:12th. Awful backpass from Collins (again!) gifts them early lead. Vaz Te misses a sitter in the 2nd half! Vaz Te and Collison return from injury. 01st Norwich City (h). 2-1. Noble(p), O'Brien. 2 up after 26mins. We hang on for our 1st christmas points! 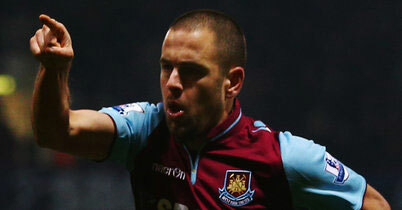 Joe Cole rejoins West Ham from Liverpool. Chamakh joins on a 6 month loan from Arsenal. ★ 5th FA Cup Rd 3. Manchester Utd (h). 2-2. Collins x2. 1-0 down, 2-1 up thanks to Joe Cole and Collins. RVP scores in injury time to save them! Brazillian Striker Wellington Paulista(?) joins on a 6 month loan. Ohhh dear! Best forget this one. The newspaper reports said we were awful! ★ 16th FA Cup Rd 3 Replay. Manchester Utd (a). 0-1. We field weakened team! Did OK but lacked any cutting edge. ✈ 19th QPR (h). 1-1. J.Cole. Battered 'em, but couldn't finsh! ★ 23rd Arsenal (a). 1-5. Collison. 1-1 at half time only to let in 4 goals in ten 2nd half minutes. 30th Fulham (a). 1-3. Nolan. 02nd Swansea City (h). 1-0. Carroll. Carroll returns to the line-up. A much needed win! ★ 10th Aston Villa (a). 1-2. OG. Yet another poor away performance! 20th Anniversary of the death of Bobby Moore. ★ 25th Tottenham (h). 2-3. Carroll(p), J.Cole. 1-0 down. 2-1 Up, they equalise and an injury time winner from Bale. Kevin Nolan out for 4/6 weeks with broken foot. 02nd Stoke City (a). 1-0. Collison. An unexpected, but welcome result! Not many turn them over at Stoke. ★ 17th Chelsea (a). 0-2. No surprises, could have been 4 or 5. Carroll had goal disallowed. 30th West Bromich Albion (h). 3-1. Carroll (2), O'Niell. 3 super goals and 3 points in the bag! ★ 07th Liverpool (a). 0-0. A great point. Both sides having goal-bound efforts cleared off the line! 13th Southampton (a). 1-1. Carroll. Another good away point. Hammers coming back from 1-0 down. ★ 17th Manchester United (h). 2-2. VazTe, Diame. Cracking full-blooded game. Wonder goal from Diame. RVP equaliser was off-side. 20th Wigan Athletic (h). 2-0. Jarvis, Nolan. Nice to turn this lot over and add to their relegation worries! ★ 27th Manchester City (a). 2-1. Carroll. LP:10th. Carroll scores with the last kick of the game through Harts legs! 04th Newcastle United (h). 0-0. They had a goal disallowed for not crossing the line, it did. We had 2 penalty decisions ignored! BFS signs a new contract. ★ 12th Everton (a). 0-2. Our usual away defeat at Everton. No surprises there! ✈ 19th Reading (h). 4-2. 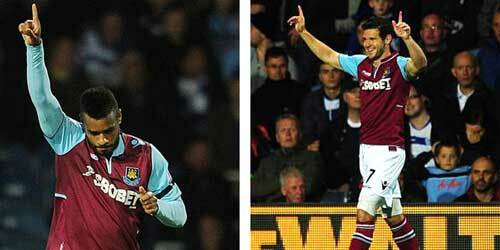 Vaz Te, Nolan x3. LP: 10th. 2-0 Up... 2-2... 4-2. Ending the season with a good win! A satisfactory season, finishing joint 10th with Swansea. BFS will still be at the helm next season, I know the stats say we aren't a "long ball" team, but at times this season it was grim watching. Not all bad though... occasionally we were great, so BFS next season... more of the great and less of the grim please. Highlights of the season... turning Chelsea over at home and Diame's goal against ManUre prompting members to sing "Brazil, it's just like watching Brazil". Worst moment... RVP scoring the equaliser for the Mancs seconds from the final whistle in the FA Cup game! 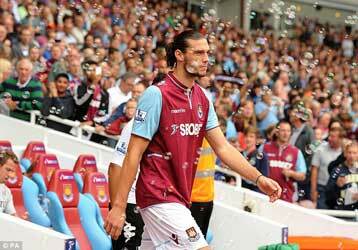 Will Andy Carroll stay... will he go! We'll have to wait and see. Seems Dublin Hammers favourite Carlton Cole will go. Good luck to him. Roll on Cork City away!